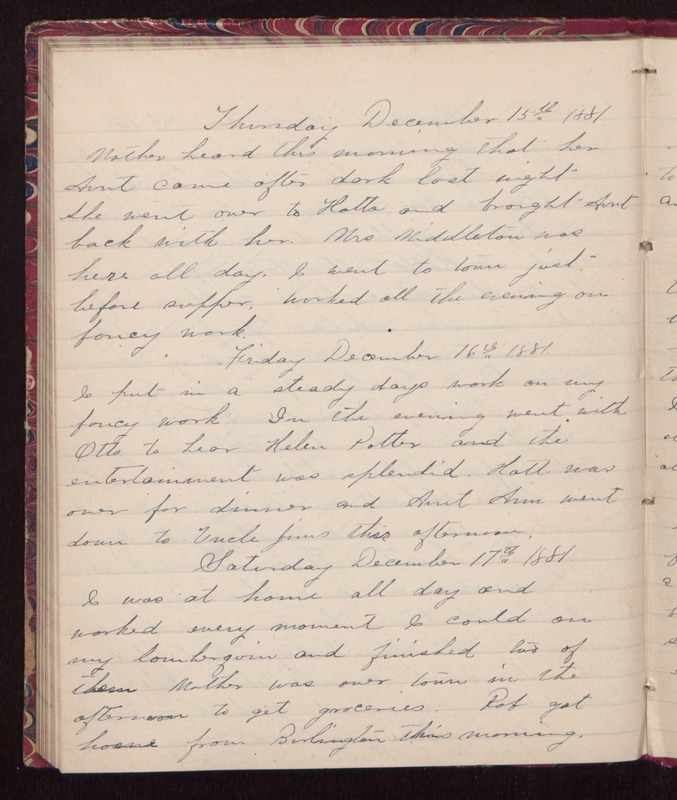 Thursday December 15th 1881 Mother heard this morning that her Aunt came after dark last night. She went over to Hatts and brought Aunt back with her. Mrs Middleton was here all day. I went to town just before supper. Worked all the evening on fancy work. Friday December 16th 1881 I put in a steady days work on my fancy work. In the evening went with Otto to hear Helen Potter and the entertainment was splendid. Hatt was over for dinner and Aunt Ann went down to Uncle Jims this afternoon. Saturday December 17th 1881 I was at home all day and worked every moment I could on my lamberquin and finished two of them. Mother was over town in the afternoon to get groceries. Rob got home from Burlington this morning.